Click on the appropriate grade below for 2016-2017 Lower School supply lists. Click for the Kindergarten school supply list. Click for the 1st grade school supply list. Click for the 2nd grade school supply list. Click for the 3rd grade school supply list. Click for the 4th grade school supply list. Click for the 5th grade school supply list. 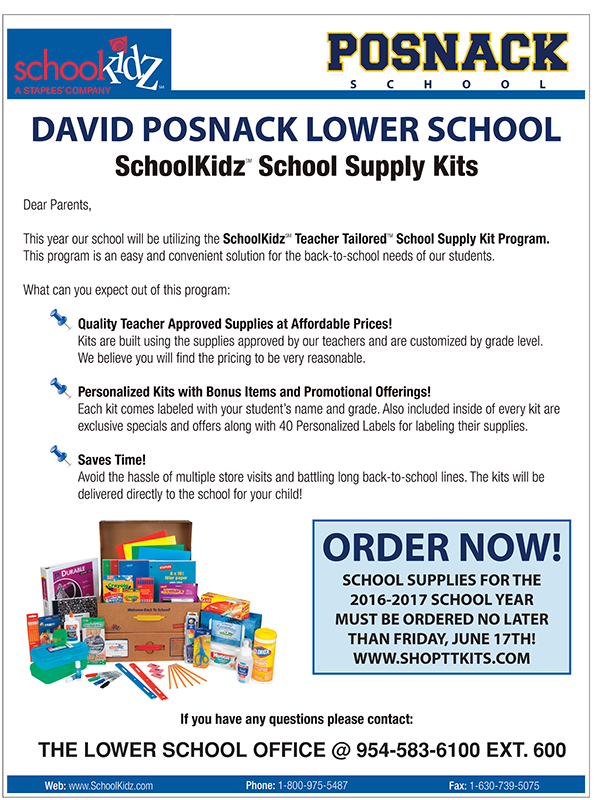 Lower School supply kits can be ordered from SchoolKidz Teacher Tailored School Supply Kit Program. Log on to www.shopttkits.com and enter our school code 10728. The deadline to take advantage of this convenient service is June 17! No additional orders will be accepted AFTER JUNE 17! This program will save you time and make back-to-school shopping less of a hassle. SchoolKidz offers brand name products in their kits such as Crayola®, Fiskar’s®, Elmer’s®, Staples®, and more. Best of all, the kits contain items that have been specifically requested by our teachers for each grade. You can see a sample of what one of these kits looks like below.